At least a million water bottles, intended for Hurricane Maria survivors, were left to rot under the Puerto Rican sun. With Hurricane Florence closing in on the Carolinas, fresh scrutiny over the federal government's response to the devastating hurricane that rocked the Caribbean island and unincorporated US territory in 2017 has been brought to the forefront. To deflect most of the blame, the Puerto Rican government has criticized the gross mismanagement of resources onto Federal Emergency Management Agency (FEMA). A senior FEMA official told CBS News' David Begnaud that "if [FEMA] put that water on that runway there will be hell to pay ... If we did that, we're going to fess up to it." 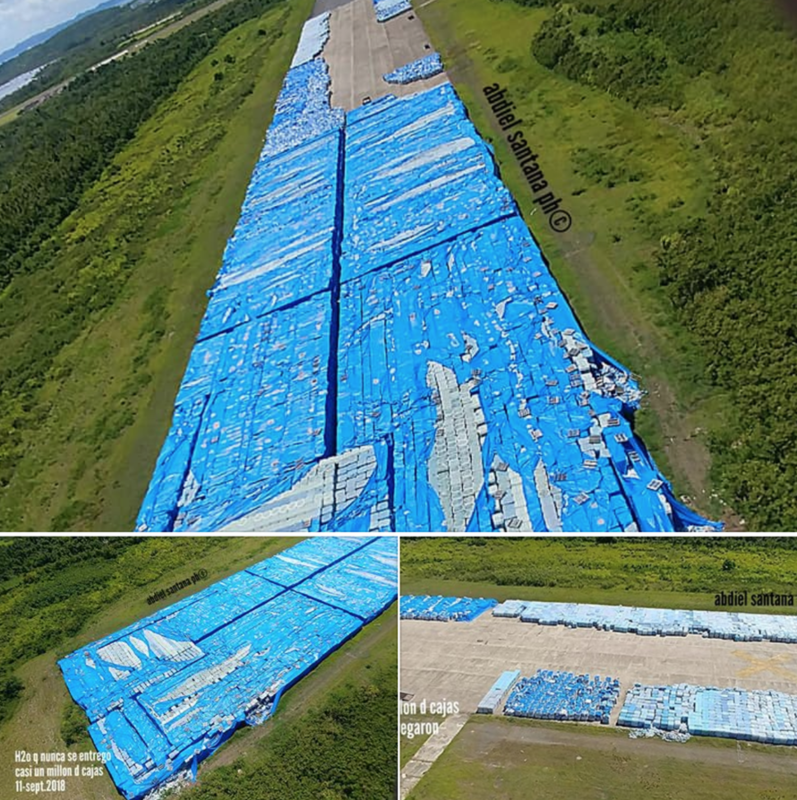 The aerial images are stunning, thousands of pallets stacked tall with water bottles currently line an entire section of a runway in Ceiba, Puerto Rico. The photos began circulating on Facebook Tuesday, the same day President Trump called the government's response to Maria an "unsung success." Last month, Puerto Rico's governor raised the US territory's official death toll from Hurricane Maria from 64 to 2,975. According to CBS News, the photos were taken and distributed on social media by Abdiel Santana, who works with the United Forces of Rapid Action agency of the Puerto Rican Police. Santana said he distributed the photos onto social media because he was furious that after one year after Maria, the bottles are still sitting at the airport. "Although you don't believe it... almost a million boxes of water that were never delivered to the village d. R., in front of hurricane Maria's emergency. Is there anyone who can explain this?" Santana said in a Facebook post. Marty Bahamonde, director of disaster operations at FEMA, confirmed to CBS News that the agency delivered bottled water to the island but said US officials did not track the shipments. Bahamonde said it is not clear what became of the bottles after delivery. CBS News notes that FEMA is now investigating whether or not they placed the bottles on the runway. Carlos Mercader, the executive director of the Puerto Rico Federal Affairs Administration, said FEMA's failures to distribute the bottles to victims on the island is obvious, they were in the agency's possession. He said the Ceiba airport is federally managed land, and that FEMA should have deemed the water bottles "excess inventory" many months ago. The GSA administrator for Puerto Rico, Ottmar Chávez, said he only became aware of the bottled water on Tuesday and does not know why it is there, how it got there or how long it has been there. He adds that FEMA needs to take responsibility for the bottles because his agency has already received complaints about how the water is already contaminated. Then again, one can ask why not a single local Puerto Rican agency or official took responsibility of distributing water that was already on the island. CBS News spoke with Barceloneta Mayor Wanda Soler Rosario who said her office was "surprised by the reports" and denied having ever made a complaint. "I want to clarify that at no time was any verbal or written information submitted that represented a complaint about the water we received," Rosario said in a statement to CBS News. On Thursday, President Trump disputed Puerto Rico's new official death toll of 3,000 and accused Democrats of inflating the numbers to make him look bad before the midterms. “3000 people did not die in the two hurricanes that hit Puerto Rico. ... As time went by it did not go up by much. Then, a long time later, they started to report really large numbers, like 3000,” Trump tweeted. “This was done by the Democrats in order to make me look as bad as possible "